Merry Christmas! 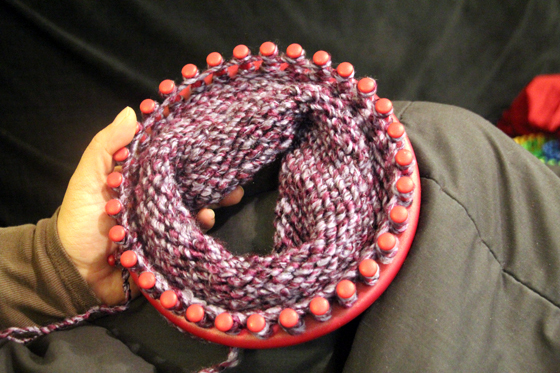 Well, the weather is just getting cold here in San Francisco, so yesterday I decided it might be a neat thing to use a knitting loom for the first time ever. 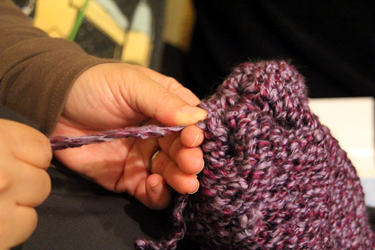 While I know how to knit simple stitches, I never really got “into” knitting before because anything past a scarf (or a baby blanket maybe) seemed a bit daunting to me. 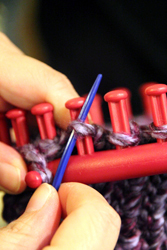 When I saw these looms, I was interested in them because they’re supposed to be a faster and simpler way to knit – ha ha ha, perfect for me! Well, turns out these looms really do make the job a lot quicker and easier. So much so, that when I got the hang of using the one I started with, I decided to go all out on the first “test” and actually make the hat in the manual. So exciting! After about an hour of just kind of getting comfortable with knitting on the loom, I had some progress to show for my work. 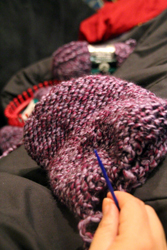 After the second hour of just knitting and watching TV, it was going pretty well! One *snag* I ran into (ha!) 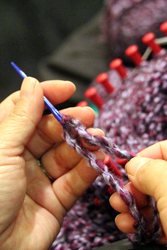 – my yarn had a knot in it! Turns out the skein I was working with wasn’t all one thread, and the manufacturer had tied two pieces together. Boo! I decided to just keep going and hope the knot ended up on the inside of my hat. After the third hour, I had enough material! 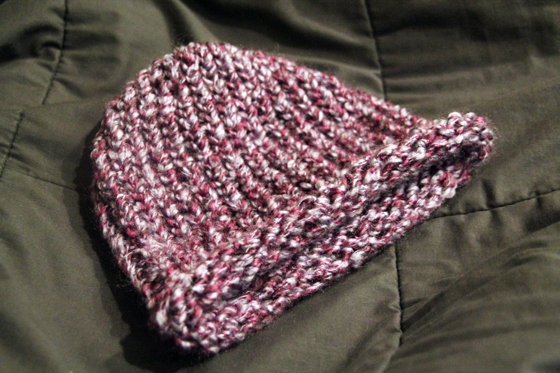 The manual had instructions for creating a brim on the hat, but I had wanted the plain version – you can see the bottom has a little roll to it (if you add a brim, it keeps the hat from rolling up like that, but I kinda like the roll effect). 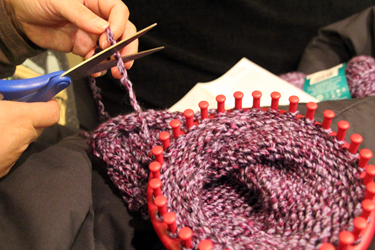 When you’ve knitted to your desired length (there are guidelines in the manual determining which length is best for the size you’re making), you just make sure you have only one loop on each peg before you start to finish the hat. Now all I did was cut the end of the yarn (leaving just enough so it won’t unravel) and then thread a new piece of yarn (about 15 inches long) onto the yarn needle included in my kit. Next, I began with the first loop I started on (the one just to the right of the anchor peg on the outside), threading that loop onto the needle, and gently pulling the loop up and off the peg, onto the new yarn I had threaded on my needle. 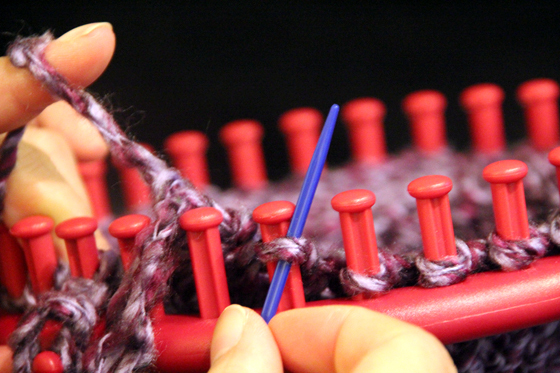 After that, you just continue along the pegs, “picking up” the loops with the needle, taking them off the loom and adding them to the rest on that new piece of yarn. 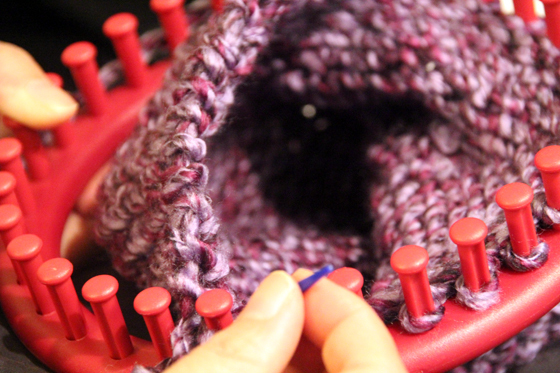 When you’ve released all the loops from the loom, you turn the hat inside out – the outside has the traditional chevron-type knitting pattern to it, but actually, the “inside” is pretty cool too – honestly I think you can just choose which you’d like for which and go accordingly. 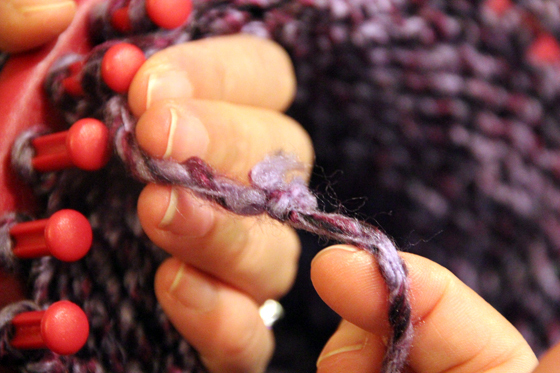 You gather all your loops together on the yarn, kind of like pulling a drawstring closed. 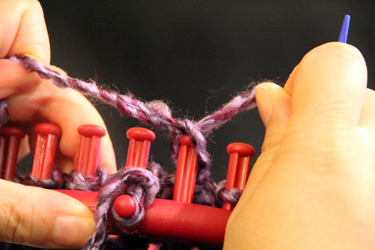 Tie a square knot, and then tie your “tail knot” from the end of your knitting to one of the pieces of the “drawstring” yarn. 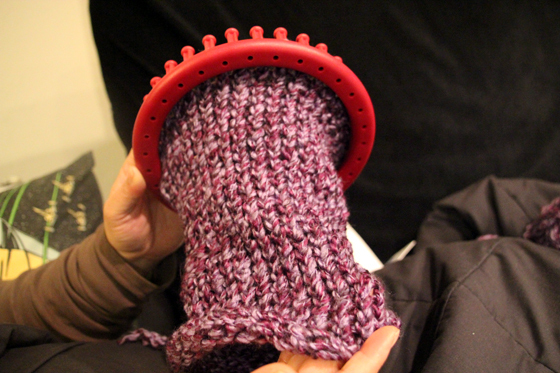 The manual says you can just leave a few inches of each of these yarn tails (since this is the inside). Flip right-side-out and voila! A HAT!!! This was beyond cool. 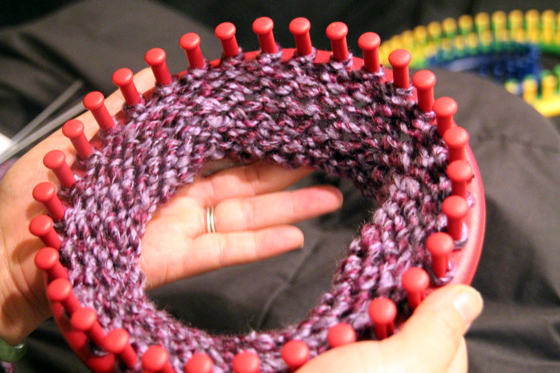 While I’m sure I could knit a hat using a circular set of needles (LOL I think that’s how you do it traditionally), I think I just found that too daunting. I am so glad I found these looms – they make the whole concept of making things out of yarn so much more approchable to someone like me, who doesn’t want to spend a lot of time and is afraid of messing up! Now, this is a very basic stitch, and totally simple design, but in looking for other patterns online, I’ve found that people are doing all sorts of neat things with these looms, varying the stitches and uses for them. 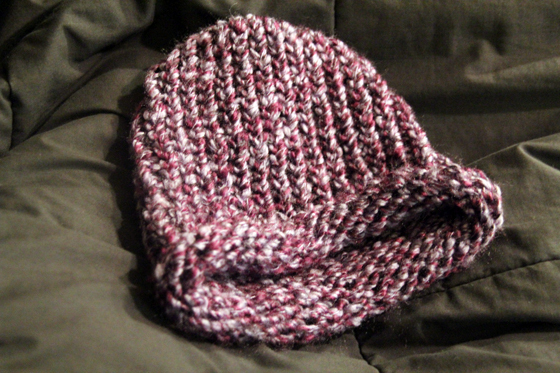 This loom basically made it a simple, attainable activity for me to knit myself a hat – something I don’t know I’d ever attempt normally – and today, I knitted a Christmas present to myself, just hanging out in front of the TV. I’m excited to see what else I can make on these, in the same simple way. This is awesome!! !